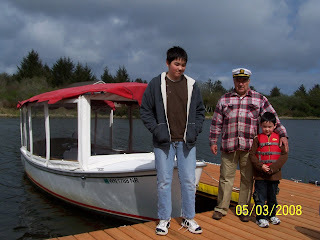 My kids had a blast in our electric-powered, rental boat from the Ocean Shores Electric Boat Company. 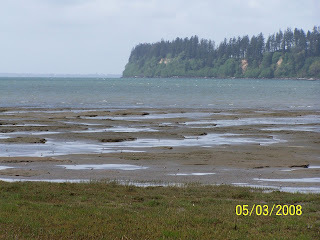 We toured the extensive network of canals and lakes that run the length of the Ocean Shores peninsula. The route to Duck Lake and back was very beautiful with tree-lined narrow canals, expensive vacation homes, and unspoilt islands turned over to the wildlife. We saw seagulls and herons. Four year old James claims to have spotted an alligator. Thirteen year old Austin enjoyed steering the boat through 360s in the middle of the lake. Proprietors Tom and Nancy Kimzey have life figured out: living full time on the water and renting boats to tourists in their semi-retirement. We had the nicest chat with them as we prepared for our trip. Their clean, modern boats seat up to 10 people. The boats include a CD player, radio, and picnic table. You can take them out in any weather. A canopy overhead screens you from the sun and plastic panels can be zipped closed on chilly days, but they still afford an excellent view.